Why yes, that is in fact Chiaki’s belt that Nodame is wearing! After the very lackluster Deadman Wonderland that I saw earlier this year, I was hesitant to start a new anime series because I was afraid of being equally disappointed. However, I decided to give the very well-known Nodame Cantabile a go. Nodame Cantabile (のだめカンタビレ) follows Chiaki Shinichi, a piano major at a prestigious conservatory who dreams of conducting. Unfortunately for him, he winds up in the rejects class after a falling out with his teacher. To make matters worse, his classmate is also his next-door neighbor, Noda “Nodame” Megumi, a weird girl who is absolutely convinced she is Chiaki’s girlfriend. Nodame Cantabile is an anime series where nothing is what it seems. When we first meet Chiaki, we see an egotistical jackass who sees everyone, particularly Nodame, as a hindrance to his own advancement. Similarly, Nodame just seems plain nuts at first glance. Yet as the series progresses, we see much more to the characters than meets the eye. I’m not exactly spoiling anything since it’s obvious that Chiaki and Nodame is the show’s central couple, but what is refreshing is how their relationship is handled. In the first episode, we see Chiaki help wash Nodame up and clean her apartment up, despite the fact that he is unsure why. Not much later, Chiaki finds himself protecting Nodame from the perverted German maestro Stresemann. 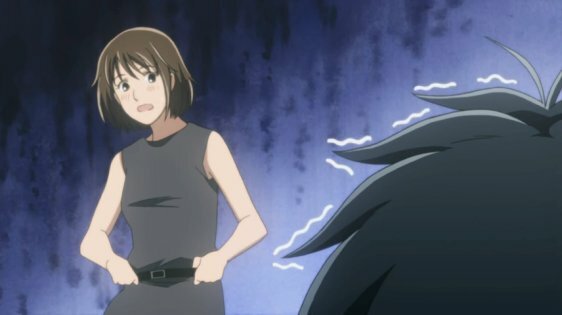 Nodame Cantabile is a character-driven “slice-of-life” drama of a flavor that is almost exactly halfway between the pure comedy of You’re Under Arrest! and the war drama Macross. Every episode has at least one major laugh-out-loud moment, but they also have those moments that make you want to pause the episode and think about what was going on. What kind of man is Stresemann in reality? Why does Nodame act the way she does? Nodame Cantabile also did what only two other anime (Trigun and Grave of the Fireflies) have succeeded in doing: It made me cry once. Despite the fact that a Japanese conservatory is not exactly the same thing as an American engineering school, I had next to no trouble empathizing with the characters and the issues they faced (namely of the “I’m about to graduate and I have no idea what the hell I’m doing afterward!” variety), and thus Nodame Cantabile kept itself from descending into just having a collection of assorted freaks. Every character had long-lasting ramifications (I’m looking at you Spice and Wolf II!). With that in mind, we see an anime that is also surprisingly critical of Japanese values as the series progresses. Not only was the music top-notch, but Kawasumi Ayako has, in my mind, demonstrated herself to be nothing short of a voice acting genius in her portrayal of Nodame. Kawasumi has voiced a variety of characters, like the title one of Kurau Phantom Memory, but I tended to associate her with shy girls like Outlaw Star’s Melfina or Ai Yori Aoshi’s Aoi. Nodame Cantabile was the first time I heard Kawasumi do a comedy role, and she gave what was easily the best performance of the series. That’s no slouch considering she was working opposite Seki Tomokazu (Among others, Van from Escaflowne and Domon Kasshu in Mobil Fighter G Gundam) as Chiaki and was supported by the likes of Nakai Kazuya (Hijikata in Gintama) and Hiramatsu Akiko (Miyuki in You’re Under Arrest!). Unfortunately, it’s clear that the producers of Nodame Cantabile weren’t trying to make the visuals the series’ main draw. More often than not, concerts were simulated by dramatically panning across still cels. On occasion, we see very meticulously (CG) animated closeups of a character’s fingers as he or she plays the piano, but Nodame Cantabile generally came off as looking far older than an anime of 2007 should. Despite the attractive character designs, which is definitely something that should be credited to the manga artist anyway, it’s clear that not a lot of money was spent on the look of the series. Still, despite the fact that Nodame Cantabile didn’t have the biggest budget, it had the biggest heart among the anime I have seen that came out in the last 10 years. While Nodame Cantabile is now 6 years old, it does make me feel better knowing that there are in fact animation studios that care about giving their series that extra something where you will need to look below the surface to really get. Furthermore, I am excited to check out both its subsequent seasons (Paris and Finale) as well as its live action adaptation; I only hope I don’t see it turn into You’re Under Arrest! : Full Throttle.